Darlings, in honor of last night’s premier of The Walking Dead, I thought you might enjoy a few tutorials to create your own zombie look this Halloween. There are a tremendous number of tricks and techniques out there to create zombie effects. 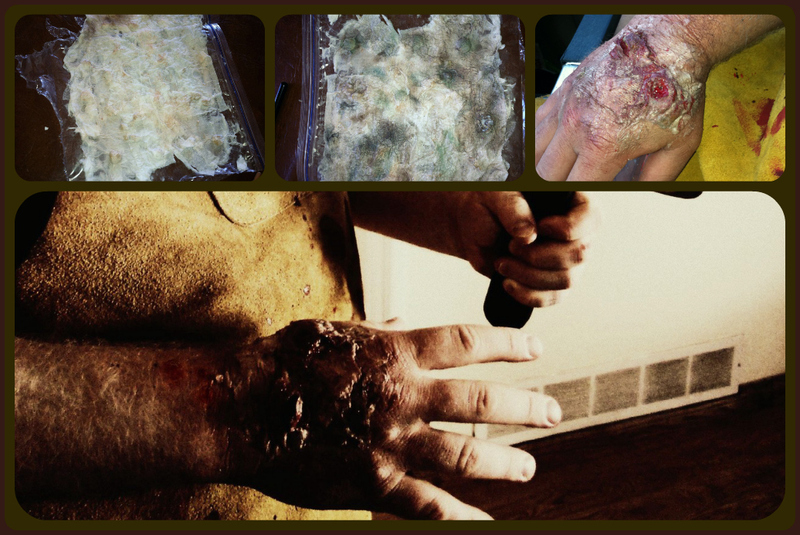 While some require serious expertise and equipment, there are many easy techniques for crafting truly spectacular zombie effects at home, with limited investment in special makeup or paraphernalia. First up, there is a the very common technique of liquid latex, as shown in this tutorial from Malabar LTD. This tutorial uses a very specific collection of stage makeup brands, but you can create a similar look using comparable costume store or inexpensive drug store products. In a pinch, you can substitute Elmer’s Glue thinned with a bit of water for the liquid latex. This oozy pustule below was created with glue, toilet paper, and inexpensive makeup layered over Kellogg’s Corn Pops. If you don’t have access to latex, or have a latex allergy, you can create tremendous effects by using prosthetic gel – a simple, inexpensive product made of plain old gelatin or a combination of gelatin and glycerin. This technique by Beauty by Brig is a quick, no fuss way to make prosthetic gel at home. Prosthetic gel is great for sculpting deep wounds and effects, although large pieces work best if attached with a bit of spirit gum. 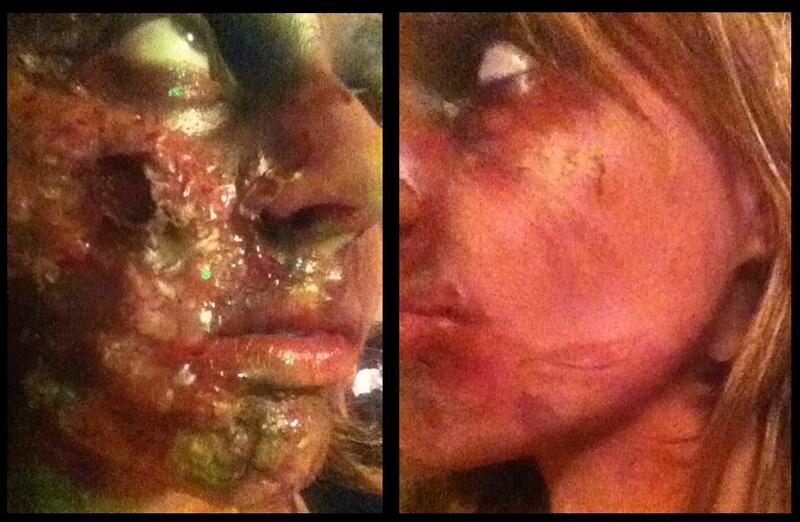 I used prosthetic gel to create this very wet looking half-rotted face. You can also use prosthetic gel with a mold to create special effects, or layered upon itself to build great, gooey blisters, like in this next tutorial from Brig. Finally, here’s a tutorial showing a combination of both techniques from The Walking Dead’s own special effects wizards, Greg Nicotero and Andy Schoneberg. I hope this gives you a little inspiration for your own Halloween costumes, darlings. Don’t forget to enter our big Halloween Contest. Get entering for your chance to win. We’ve already had three winners so far and I simply can’t wait to play with you, my dears. Yay for zombies! I really like the ‘spider bite gone wrong’ makeup…the stitches are amazing. Right? Those stitches are such a clever idea – I’m certainly adding that to my technique list! It would work well for a surgery gone wrong technique, too. I make a lot of movies and short films … will have to keep this in mind. Thanks for posting all of these great techniques! I’ll have to give it a try as well! Excellent stuff, sweetie. Entertaining and educational. I give it two rotting zombie thumbs way up! Thank you, darling. I hope it gives you some food for thought if you get a chance to wear a costume this year! Fabulous stuff, thanks for sharing! What are you going to be this year? I usually have a whole series of looks for October, but for my main costume, I think I’m going to go with a circus theme this year. Just haven’t settled on what yet. Have you decided on yours this year? Well, I have and I have not. I have a gold chain mail dress that I picked up at a thrift shop. I am going to be Cleopatra, but the hard part is whether to go for the Liz Taylor version or a mummy/zombie Cleopatra look. Decisions, decisions…. Imedge number one looks like me! Yay! Probably from all that time stuck in the monitor. That’s some very impressive work on the face Ms. Halloween. I’m amazed that anybody can manage such realism with relatively simple products. Thank you, darling. In all, I think I would go a bit smaller next time – the more subtle effects often have the most impact. Thanks for the repost, darling – glad you enjoyed it! HEY LADY, YALL OFFEND ME AND IVY! WE ALWAYS LOOKS LICK DAT! C, SHE EVEN SED, DAT DAT LOCKS LICKER! And yes, MY licence says I can also call ya Redge! 😀 No problem! Love the show. Love all things TWD.